6.2 Changing Things Up When Flying! 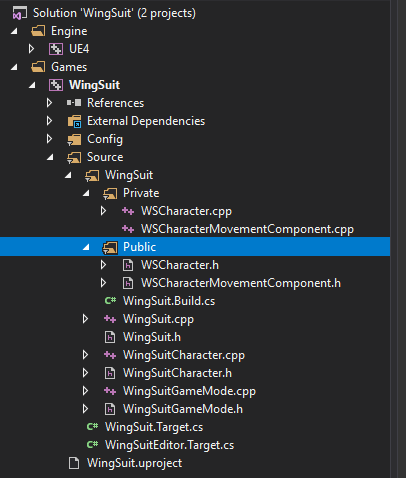 This tutorial will walk you through how to create a wing suit flight system for the character controller with multiplayer support. We will be observing proper practices and integrate it fully into the CharacterMovementComponent to leverage the systems that it is built around. This system does not exclude the initial functionality of a character, but rather it is integrated into it. To keep things simple, when you walk off a ledge or reach the apex of a jump up it will enter flight mode automatically. This is an intermediate level tutorial. 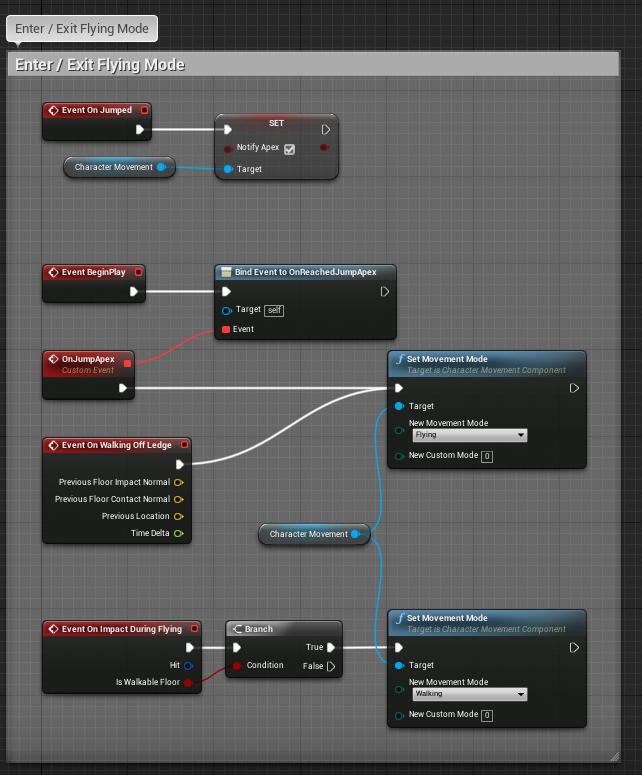 This tutorial is largely based in blueprint but requires some C++ setup to give us the entry points we want for Blueprint. If you would prefer to use C++ it should be immediately obvious how to do so, assuming you are experienced enough, however this tutorial is BP focused and wont cover a C++ implementation. Due to proper integration you will not need to know or do any networking, however to customize the system to your own needs you will likely want some familiarity for when things no longer work as expected. Launch the engine and create a Blueprint project based on the Third Person template. 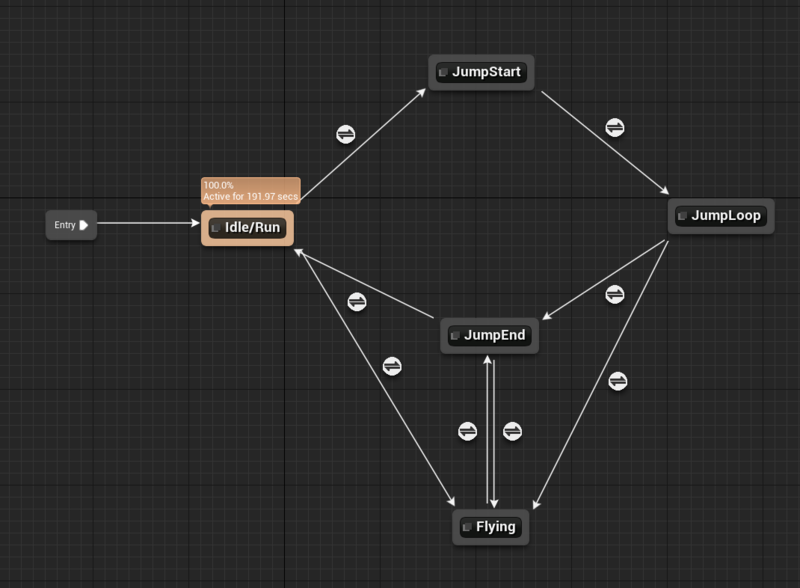 I have named the project WingSuit for this tutorial. 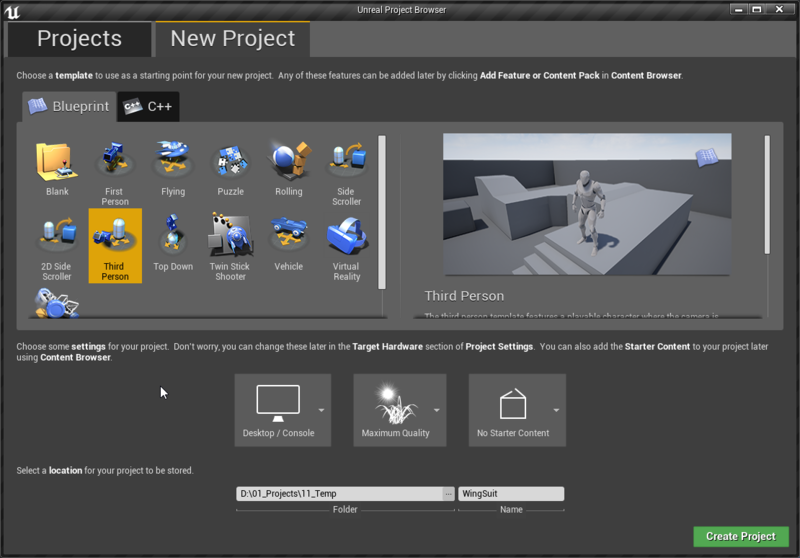 From here-on out, any class or project names I used will be used to refer to our own classes or blueprints. Create two new C++ classes, one based on Character and another based on CharacterMovementComponent. For my purposes I have named these WSCharacter and WSCharacterMovementComponent respectively. For CharacterMovementComponent you will need to check ``Show All Classes`` and type the name. CMC (CharacterMovementComponent) uses a physics loop for any movement. This helps to eliminate inaccuracies, particularly at varied and low frame rates. For example, if you were to trace downwards each frame to find the floor, you could move to a position before you hit it on frame 1 and then on frame 2 you could be past it, so there was no frame where the trace would succeed. CMC combats this by checking back over each frame. By placing our own flight movement code into CMC physics loop we get the additional accuracy - flight feels smoother, more responsive, accurate. Another aspect we will achieve is to use the systems that are already in place, such as acceleration and velocity, which are not only replicated but built into CMC's prediction system which means it works with the client-side prediction and server reconciliation that allows for responsive movement while still remaining server authoritative (and therefore not prone to being hacked). Because we will only modify these variables there should be no additional work required for multiplayer; it will work out of the box. Close the editor! - When it's time to build the code having the editor open will cause it to hot reload instead which will cause problems. Open the solution if it isn't already (WingSuit.sln if you used my naming). Expand the project to view the classes we added in the previous step. There are two basic things that we need to be able to access from Blueprint to create a flight system. We need an entry point to handle the movement, and we need to know when we colliding with something or landed. 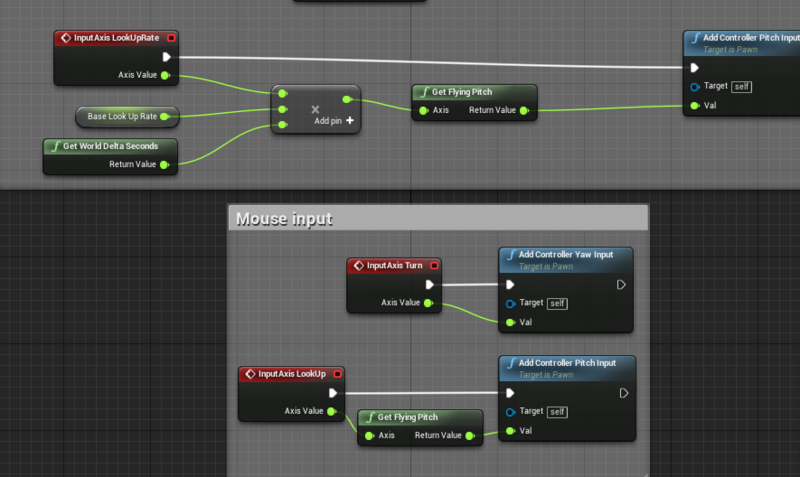 We will add a tick event that we can override in Blueprint to provide the flying functionality. And we will add another event that is called whenever we impact another object (and it tells us if we impacted a walkable floor). Also, we need to add a constructor so that we can tell WSCharacter to use the WSCharacterMovementComponent that we made. * Entry point for handling of flying movement. * indiscrepancies at varied frame rates. Delete the auto generated classes so we are left with just the include line. The OI.SetDefaultSubobjectClass tells it to use our UWSCharacterMovementComponent for the CharacterMovementComponent. As previously mentioned, CMC provides a physics loop for each movement mode. In the header we added the override for the flying physics loop. To construct this, I copied the default definition from UCharacterMovementComponent, then I added a while loop (the same used for PhysWalking and PhysFalling). From there I cast the character to our own and added the two calls to the blueprint events in our WSCharacter. The code here looks very complex, but like with most things becomes basic when you break it down. 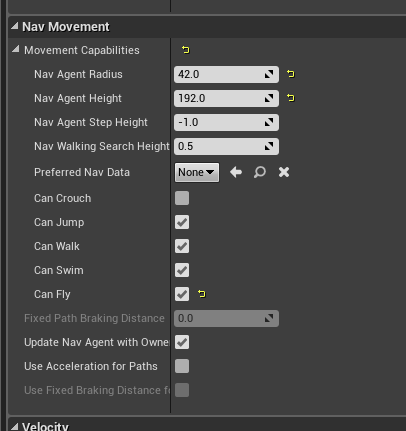 However that is out of the context of this tutorial, for now the important thing is that the flying is substepped and we have it calling the relevant blueprint events and there is basic collision handling. The editor MUST be closed! If anything failed, check that the code matches my own. Copy/paste if in doubt. Open up ThirdPersonCharacter and reparent the blueprint to our own. We want to be in wing suit mode when we walk off a ledge or when we reach the apex of a jump - basically any time we're in the air and not jumping upwards. You may have different requirements for your own game, but for the purpose of this tutorial I want to keep it simple. And when we land on a walkable floor, we want to return to walking. Changing Things Up When Flying! There are a few things you may want to happen when entering or exiting flying mode and we do this in the OnMovementModeChanged event. For the purposes of this tutorial we will add some camera lag while flying, for regular movement this feels unresponsive but when flying it can give a nice feel to it. In the CameraBoom settings temporarily check the Enable Camera Rotation Lag so you can set Camera Rotation Lag Speed' to 5. A lower speed means a smoother/less responsive camera. Disable Enable Camera Rotation Lag. Also set Target Arm Length to 800 (or whatever distance from the character you desire. Add a float variable called FlightSpeed. Default 0. Add another called InitialFlightSpeed. Default 500. When we enter flight mode we will enable camera position and rotation lag and also set the flight speed to a higher initial value, so that we don't start out falling! And provide a boost to the velocity to help us in the same regard. When flying the pitch of the character is modified, when landing we want to reset the pitch as it isn't used for walking. Also time to disable the camera lag! Another thing you may want to do is invert the camera pitch when flying. Optional. Make sure to mark GetFlyingPitch as Pure in the Details panel. Now we get to the juicy part. Making him actually fly! 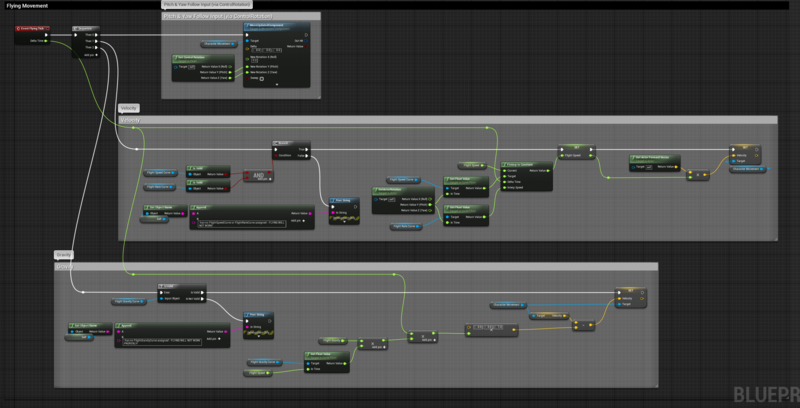 When designing this system, I wanted it to be highly customize-able and I achieved this using curves. 1. FlightSpeed What this curve implies is that if we have a pitch of -45 (pointing down) then the speed should be 700, a pitch of 0 should be 400 (pointing ahead), pitch of 45 (pointing up) should be -100. This isn't the absolute speed, it is the influence on the speed. If we are pointing up then speed is deducted at a rate of 100 (or added at a rate of -100). 2. FlightGravity This curve implies that if we are moving at a speed of 0 then apply a gravity multiplier of 90, at speed of 225 apply 24.5, at speed of 700 apply 0.75. This equates to a faster speed applying less downwards force so maintaining your speed allows you to maintain your height. 3. FlightRate FlightRate is the interpolation rate applied based on our pitch, essentially affecting how fast our speed changes based on our pitch. At a pitch of -45 the interpolation rate is 200 (very fast change to reward facing downwards), at a pitch of 0 the rate is 10, allowing for very gradual changes when oriented straight ahead, and at a pitch of 45 the change is moderately fast, allowing us to aim up a bit without too drastic a change (but also punishing this decision if maintained). Add three parameters of type Curve Float named FlightSpeedCurve, FlightRateCurve, and FlightGravityCurve. 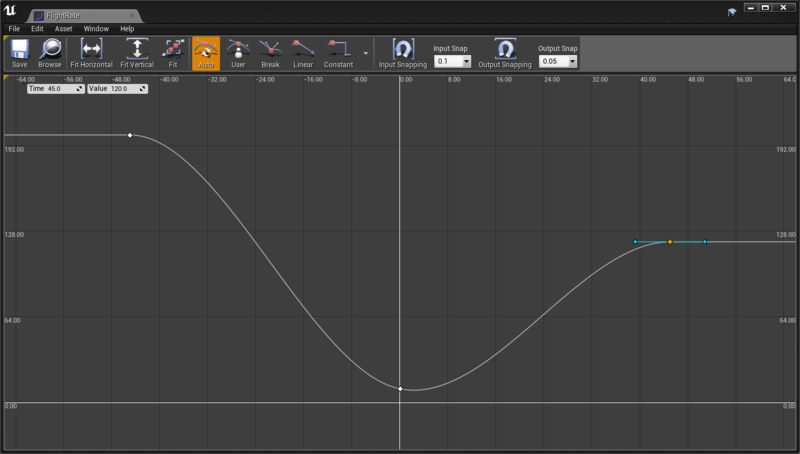 Assign the curves outlined in the previous step to these variables. 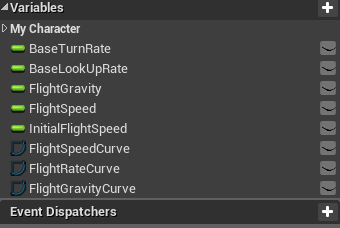 Add a float parameter called FlightGravity. This is used to determine the gravity while flying. Default 980. Check that our curves aren't missing, and print a warning if they are! And finally, we apply our velocity based on the direction the character is facing with the magnitude set to our movement speed. 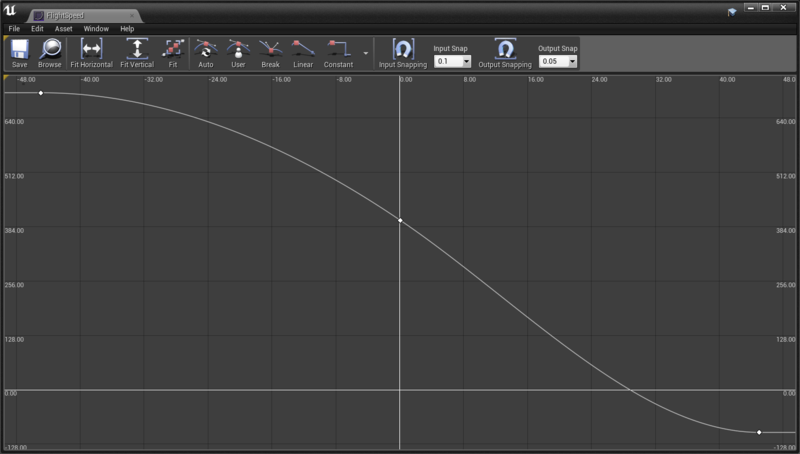 Check the curve is valid, again. Essentially what we are doing for the gravity is reducing the velocity based on the up vector multiplied by a gravity value. The amount of gravity is influenced by how fast we are moving - essentially causing a greater downward pull when moving at lower speeds. I have included a very quick/basic and ugly (lets be honest) animation of a person flying, this is actually just a modified walk cycle with the joint rotation changed. I recommend a transition duration of 1 second into flying and 0.4 seconds out of flying with this animation. 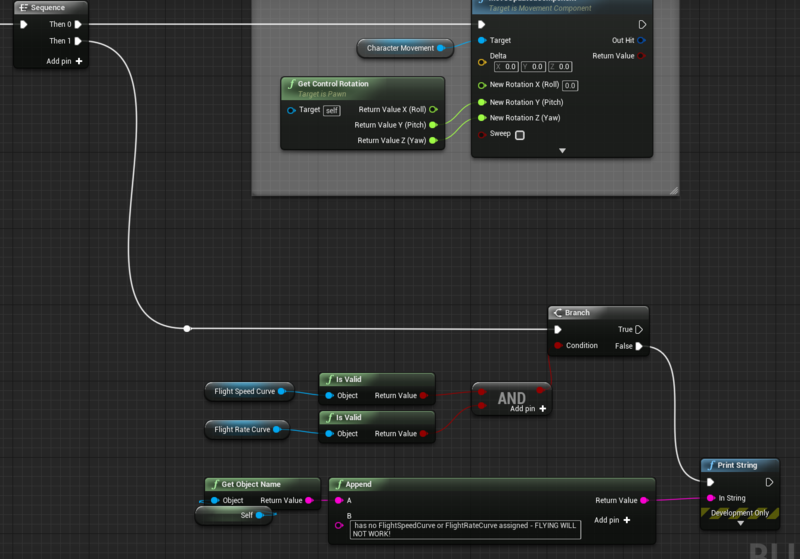 For the transitions into flying add the condition Is Flying and for the transitions out of flying add the inverse. To really get a feel for it you will want to modify the ThirdPersonExampleMap. 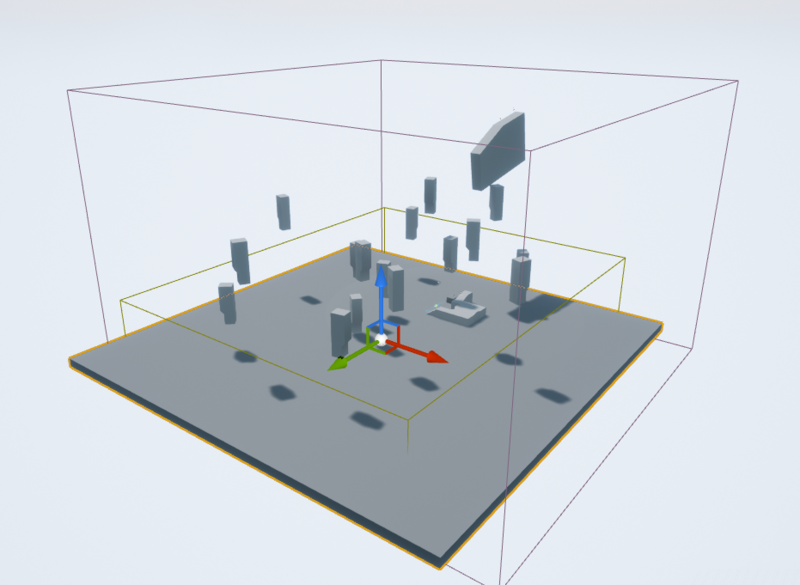 Here I added a bunch of objects, extra start positions (for multiplayer) and placed objects high up for jumping off.